Adults, children of all ages, and their pets currently enjoy Hearst Park in all seasons. People enjoy tennis, soccer, sledding, pick-up baseball games, dog walking, cross-country skiing, and some general relaxation under its old-growth trees, to name a few. This storm water footage filmed May 5, 2017 illustrates the serious storm water management implications the city has failed to study or plan for before stating that Hearst was a suitable site for a pool and pool house. Hearst Park Hydrology. 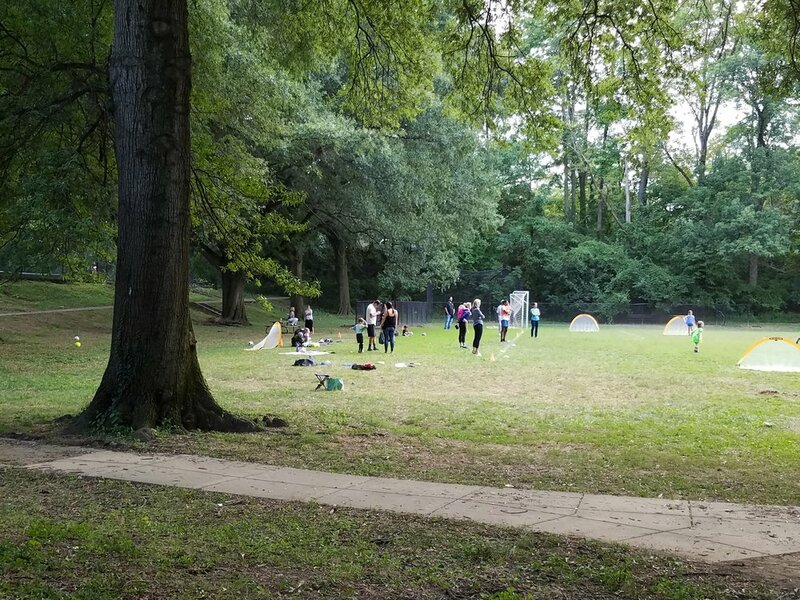 The soccer field and tennis courts were created in the early 1930s by filling in ravines and rerouting streams that are part of the Rock Creek Park watershed. The fill dirt is up to 30 feet deep, creating a "sponge" that collects storm water flowing downhill from nearby higher ground. Heavy rain causes overflows with runoff flowing into the neighborhood below. The report concludes that construction of a swimming pool in these soil conditions might be impractical and unduly expensive, and that the pool hardscape proposed for the park would exacerbate existing storm water runoff problems. DGS has not addressed these question. ANC 3F signed a Resolution Requesting Formal Involvement of DOEE in the Design of the Hearst Recreation. 1931: Chief Engineer Irving Root unveiled a master plan for the NCPC, entitled the Preliminary Master Plan of Highways and Parks. Included layout of Cleveland Park largely as we know it. Capper-Cramton provided funds for this purpose. Pursuant to Act of Congress approved June 6, 1924, Title 40, Section 73, U.S.C. and Act of February 26, 1925, Title 40, Section 2, U.S.C. 2010: Capital Space, a joint Federal and District multi-agency initiative, lays out master plan for ‘Ideas to Achieve the Full Potential of Washington’s Parks and Open Space’, includes ‘Big Ideas’; seems to emphasize maintaining open space. Lots of splash parks resulted. Environmental aspects are emphasized.